Fried rice comes from Chinese cuisine.But Chinese barely add minced meat to the Fried rice,but why not think out of the box? We can call this an Indo-Chinese fusion recipe. This particular dish turned out to be very tasty and satisfying. And a)2 cups of Long grain rice. 1.First cook Long grain rice. 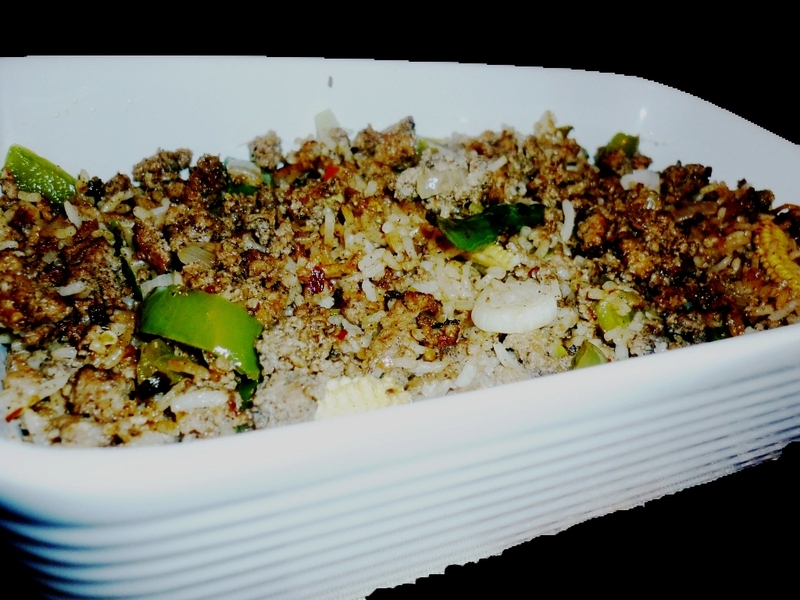 2.Cook minced meat with salt,pepper,ginger-garlic paste and very little water .Keep aside. 3.In a wok,add 1 tbsp oil.Saute crushed garlic and dry red chilies. Now add all the veggies and 1 tsp Worcester sauce.When its half cooked add the prepared meat mixture and saute well until color changes to dark brown. Now add remaining Worcester sauce and rice.Mix well,add plenty of spring onion on top.Now close the lid and simmer for 5-8 minutes. Tempting n mouthwatering meal ! !